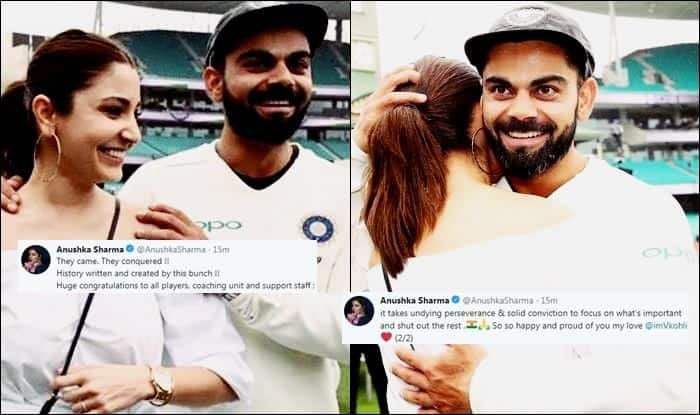 India vs Australia 2018-19 Tests: Anushka Sharma was there when it happened with husband and team India skipper Virat Kohli. They came. They conquered !! History written and created by this bunch !! Anushka was there throughout the Melbourne and the Sydney Test and was pretty close to the team hence she could realise what it meant to the entire squad. A feeling that very few would understand. Meanwhile, things turned out to be a bit of an anti-climax in the end as India had a fair chance of adding insult to the injury with a 3-1 victory margin as they got the home team to follow-on in their den for the first time in 30 years after scoring 622 in their only innings.